When was the last time you updated your family photos? Here is your chance to do just that at a portion of the price! To many people put off updating their images to then be left without any recent photos of their loved ones when the sad time comes that they pass away due to unforeseen circumstances. Don't be the one that has to live with this regret. We had to face this recently when my daughter had to do a school assignment on her grandfather to find there wasnt any photos of him to use except one that wasnt very good. Its way too late after they are gone so book yours in today before its too late! These are the perfect gift for the grandparents, friends, inlaws, sister, brother, your family and more. You can book it for yourself or anyone you want and you can also use the photos as Xmas presents for your family. What better gift than a lifetime of memories + PRICELESS! If you share this with all your friends I would like to ask you to comment below the post to say so and once these are full I will be DRAWING OFF A FREE SESSION FOR 1 FAMILY. SO SHARE SHARE SHARE AND TAG ALL YOUR FRIENDS IN THIS POST PLEASE. First in best dressed with these sessions. There is 8 sessions for each day. Starting at 9am. 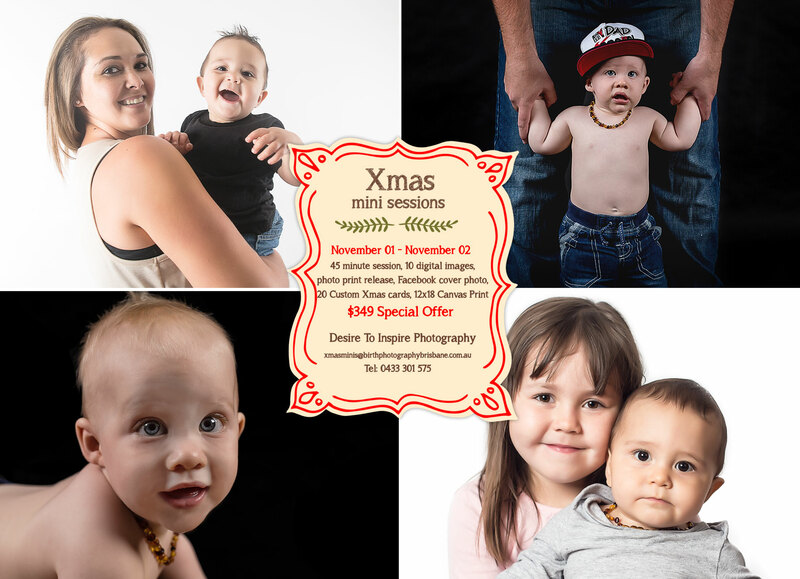 To book your session you need to email me on xmasminis@desiretoinspirephotography.com.au and they will be booked in order of emails sent. Please email your phone number and full name in the email. $100 deposit due at time of booking and must be paid within 24hrs otherwise your booking will go to the next in line. No newborns for these sessions. Available for babies from 6mths, families, children. Great time to update your family photos and be able to gift a memory to last a lifetime to your family for xmas. Extra prints and products available also. You will be proud of your images I capture for you on the day so get in fast and book your preferred spot before they are all booked out!